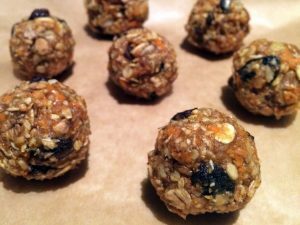 The “ball snacks” are becoming really trendy in the world of cuisine and I couldn’t not to try at least one recipe. Those energy bites are a great option for mid day snacking. That’s actually my first snack recipe, and for a first it is not too bad. They are healthy, and also ideal as a pre-event and recovery snack. 1- Mix all the dry ingredients together in a large bowl: the walnuts, the oats, the grounded almonds, the cinnamon. 2- Add the peanut butter and the honey and mix well with a large spoon. As you can imagine, it is going to be very sticky but don’t give up, keep mixing to make it as even as possible. 3- Add the grated carrots and the raisins and mix again. If it crumbles too much, add a spoon of water to moisturize the mixture a little bit and mix well. 4- Use a 20x20cm piece of cling film that you will hold in the palm of your hand, scoop out about 20 grams with a spoon, put in your hand and cover with the cling film. Shape a nice and even ball by squeezing firmly with both hands, open the cling film and gently put the ball in a plate. Repeat until there is no mixture left. Keep in the fridge for at least 2 hours before eating.